Does your dog eat too quickly? You've only just put Royal Canin dog food into your dog's bowl and before you've had a chance to put the bag of food away, your dog's bowl is empty. Eating too quickly is a common problem in dogs. When your dog eats too quickly, it doesn't chew its food properly and gulps in air, leading to all of the bodily discomforts that this can cause. It is hard to teach your dog not to gobble, but it's easy to stop your dog doing it. In this article, you can read all about (preventing) gobbling in dogs. There are various possible causes of gobbling. Gobbling is relatively common in dogs that have spent an extended period of time without sufficient entertainment (for example in kennels or a dog shelter). In kennels or shelters, dinner time is often the highlight of the dog's day, and some dogs frantically launch themselves at their food bowl to gobble up their food. Gobbling can become part of the dog's behaviour, particularly in dogs that spend a long time in an environment where they are not stimulated. This will cause them to continue to gobble, even in a new environment. 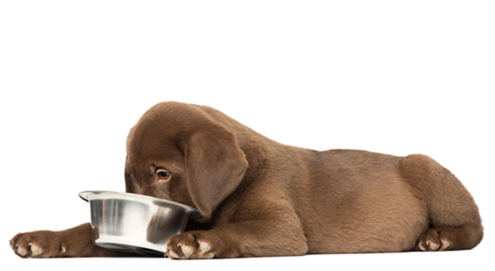 When puppies are fed from a single bowl, this may lead to a situation in which the puppies are "forced" to eat too quickly in order to get enough food. This behaviour can also start at a later age when there are several animals around at dinner time. The dog will quickly gobble up its food out of "fear" that another animal will eat its food. In addition, instinct can also be a cause of the gobbling. In the wild, animals often have to fight for their food and the "first come, first served" principle applies. In these situations, it is also important to be the first to finish their food. This makes it difficult to teach your dog not to gobble. Dogs that gobble do not chew their food properly. As a result, large chunks of food end up in the dog's stomach, putting additional strain on the dog's digestive system. Dogs that do not or barely chew their food often have bad teeth. Good chewing also keeps the teeth clean. What's more, greedily gobbling up food also leads to the dog swallowing a lot of air. This increases the risk of flatulence, which is particularly unpleasant for you as the dog's owner. As a result of the speed at which gobbling dogs eat, it will take them longer to feel full. That is why dogs that gobble are more likely to become overweight. Especially dogs of breeds known to be gluttonous, such as Labradors, have an increased risk of rapid weight gain. In exceptional cases, gobbling may lead to gastric torsion. Gastric torsion is often caused by (a combination of) various factors. Eating too quickly, swallowing air, eating too much and exercising too soon after eating or even whilst eating are some of the factors that can increase the risk of gastric torsion. Because in many cases gobbling is part of the dog's behaviour, it is difficult to unlearn it altogether. However, there are various simple but effective measures that you can take to stimulate your dog to eat (more) calmly. Use special anti-gobble bowls, such as the Buster Dog Maze, Slo-Bowl Feeder, Eat Slow Feeder or AFP Interactive Food Maze - or make your dog's food bowl smaller by putting a little bowl into it upside down. This reduces the surface of the bowl and prevents your dog from eating large amounts of food in one go. Put food in specially developed feeding toys such as the Kong Biscuit Ball and Kong Wobbler from KONG or use the Kong Classic. Interactive Nina Ottosson dog puzzles (for both dry food and wet food) can also provide comfort while eating. Dog puzzles are effective as there is not a lot of food available for the dog in one go, and the dog has to make an effort to get to it. This is a fun way for dogs to have their dinner. Adjust the size of the food chunks to the size of your dog. A large dog that is given small chunks does not need to chew as much, which can make it easier to gobble up. Do you have any more questions about gobbling or teaching your dog not to gobble? Please contact our veterinarian by phone on 020 3191 8322, or via e-mail at: veterinarian@vetsend.co.uk. Unique food dispenser for horses, dogs, cats, ferrets & rabbits. Innovative food bowl to stop dogs eating too fast. Prevents dogs from eating too quickly. Hide treats inside this high-quality ball. Prevents small dogs from eating too quickly. Bowl in the form of a maze to prevent eating too fast. Amusing & entertaining dog treat game. Robust dog toy made from natural rubber.